This lamp module includes both the housing and bulb. 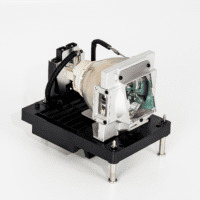 All versions of this replacement lamp are manufactured to the highest ISO9001 standards to fit and function perfectly in the projector model(s) listed under the Specs tab. Each lamp has undergone quality checks for performance, ignition, voltage, appearance, connections, and run-time by the manufacturer.